On the same day that we attended Hometown-Homegrown at the Heinz History Center, the first edition of Tapped. 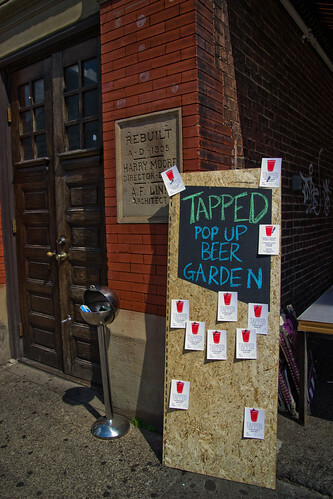 Pop Up Beer Garden was also happening down at the other end of the Strip District, in the parking lot adjacent to Bar Marco. Since we were already in the 'hood, we thought it might be fun to check out this new event as well. 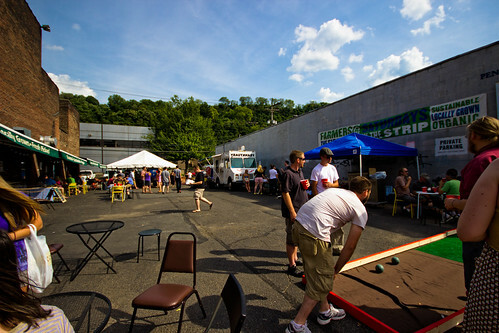 Tapped is basically a party that, well, pops up every couple of weeks or so throughout the summer in different parts of Pittsburgh. As of this writing, Tapped v. 2 has already taken place in Lawrenceville, but several more are planned for the coming weeks. 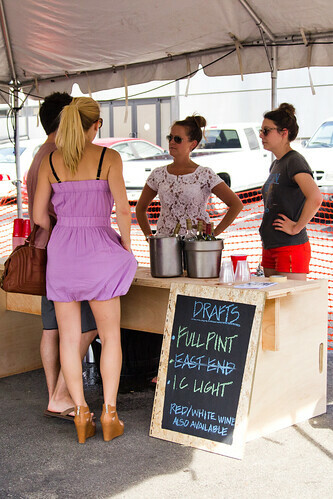 The goal of Tapped is to bring local beer, food, and music to a local neighborhood for a one-day shindig. In terms of local beer, the draft list consisted of Full Pint's All-in Amber, East End's Monkey Boy Hefeweizen, and IC Light, and wine was available as well. A Full Pint IPA also became available later in the afternoon. We tried both Full Pint beers and the Monkey Boy, with my favorite being the latter, and I guess that was everyone's favorite as well as they were out of it by about 4 pm! 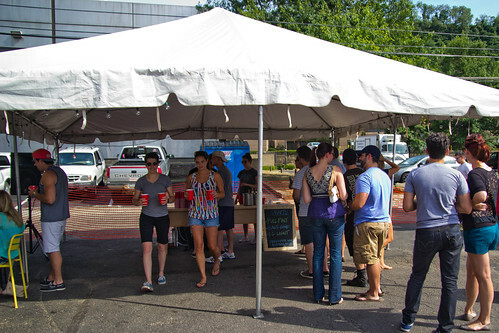 For eats, the Franktuary truck, Lucy's, Bar Marco, and Fat Cat Baked Goods were on hand. Future Tapped events will also feature the Pgh Taco Truck (I will have more to say about this new food venture in a future post). 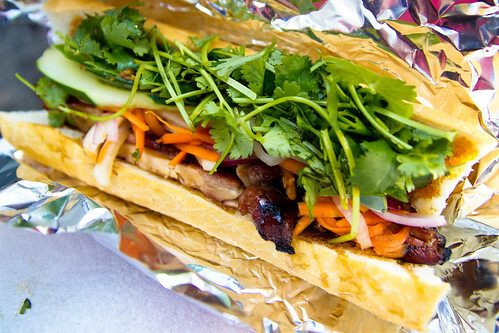 I decided to try one of Lucy's banh mi because I had heard good things before. The sandwich consisted of grilled chicken, carrots, pickled red onions, cucumbers, jalapeno peppers, and cilantro inside a French baguette, and it was absolutely rave-worthy! In addition to beer and food, there was also live music, as well as bocce ball. Follow Epic Developments blog, twitter feed, or Tapped. 's Facebook page to get details on future Tapped. events.